There are many people who believe that a person and his or her environment are integral to each other. That is, a patient can't be separated from his or her environment when addressing health and treatment. By practicing nursing with this view of the coexistence of the human and his or her environment, a nurse can apply Martha E. Rogers's Science of Unitary Human Beings to treat patients and help them in the process of change toward better health. Martha E. Rogers was born in 1914 in Dallas, Texas. She received her nursing diploma from the Knoxville General Hospital School of Nursing in 1936, then earned her Public Health Nursing degree from George Peabody College in Tennessee in 1937. 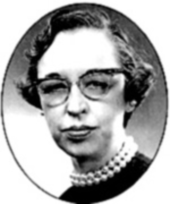 Her Master's degree was from Teachers College at Columbia University in 1945, and her Doctorate in Nursing was given to her from Johns Hopkins University in Baltimore in 1954. Rogers died on March 13, 1994. Rogers worked as a professor at New York University's School of Nursing. She was also a Fellow for the American Academy of Nursing. Her publications include: Theoretical Basis of Nursing (1970), Nursing Science and Art: A Prospective (1988), Nursing: Science of Unitary, Irreducible, Human Beings Update (1990), and Vision of Space Based Nursing (1990). Patients are considered "unitary human beings," who cannot be divided into parts, but have to be looked at as a whole. According to Rogers's model, patients have the capacity to participate knowingly in the process of change. The environment is also irreducible, and coexists with unitary human beings. In this model, humans are viewed as integral with the universe. That is, the patient and his or her environment are one. Rogers defined health as an expression of the life process. To that end, illness and health are part of the same continuum, and the events occurring throughout the patient's life show how the patient is achieving his or her health potential. The basic characteristics that describe the life process of the patient are: energy field, openness, pattern, and pan dimensionality. The energy field is the fundamental unit of all, both the living and unliving. It provides a way to view the patient and his or her environment as wholes, and it continuously changes in intensity, density, and extent. Openness refers to the fact that the human and environmental fields are constantly exchanging their energies. That is, there are no boundaries that block the flow of energy between fields. Pattern is the distinguishing characteristic of an energy field that is seen as a single wave. It's an abstraction, and simply serves to give identiy to the field. Pan dimensionality is a domain that has no spatial or temporal attributes. Nursing in the Science of Unitary Human Beings contains two dimensions: the science of nursing, which is the knowledge specific to the field of nursing that comes from scientific research; and the art of nursing, which involves using the science of nursing creatively to help better the life of the patient. In this model, the role of the nurse is to serve people. Rogers also proposes noninvasive modalities for nursing, such as therapeutic touch, humor, music, meditation and guided imagery, and even the use of color. The interventions of nurses are meant to coordinate the rhythm between the human and environmental fields, help the patient in the process of change, and to help patients move toward better health. The practice of nursing, according to Rogers, should be focused on pain management, and supportive psychotherapy for rehabilitation. It is often important to look at both the patient as a whole person, and the patient's environment when treating the patient for an injury or illness. Martha E. Rogers's Science of Unitary Human Beings addresses the importance of the environment as an integral part of the patient, and uses that knowledge to help nurses blend the science and art of nursing to ensure patients have a smooth recovery and can get back to the best health possible.